What Is Tuberculosis? 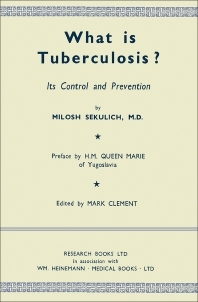 : Its Control and Prevention provides an introduction to the understanding of tuberculosis, a contagious lung disease caused by tubercle bacillus. This book discusses the characteristics, causes, treatment, control, and prevention of this disease. Organized into two parts encompassing 85 chapters, this book begins with an overview of the nature of the problem of tuberculosis. This text then explores the characteristics of tubercle bacillus, which is very resistant and can live for a long time outside the body especially in damp dark places. Other chapters consider the modes of infection and explain how bacillus tuberculosis enters the body by inhalation and by ingestion. This book discusses as well the most dangerous source of infection, namely, a patient with open tuberculosis of the lungs. The final chapter deals with tuberculosis as a useful index of the social and economic conditions of a community. This book is a valuable resource for physicians and scientists. Part I What is Tuberculosis? Should a consumptive be told the truth? Is Tuberculosis as a social disease curable?